A new Victoria funeral home dedicated to pets will be offering live webcasts for those who can´t make it to a service or cremation. 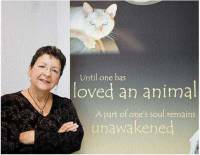 The Greater Victoria Pet Memorial Center opens Nov. 7 at 485 John St. to serve grieving "pet parents" with around-the-clock, seven-day service, covering the south Island as far north as Nanaimo. "This is for those who consider their pets family members," said Jocelyne Monette. Cremation will be offered on site, as well as celebration of life memorial services with viewings, in which the animal´s body will be on a table with blankets, Monette said. She prepares the body by washing and combing it. Services are also available in homes. Because most owners refer to themselves as "mommy or daddy," Monette calls them "pet parents." Monette said her business will be a place where pet owners have a place to grieve. One study from the U.S. found that some people grieve more for a pet than for a human, she said. "A loss is a loss. It doesn´t matter what it is. Every person´s grief is individual. Nobody´s grief is the same as the next person´s," Monette said. A pendant around her neck holds ashes and fur from Chelsea, an 18-year-old Siamese cat who died in July. "She´s my lucky charm so I will always have her with me," Monette said, holding the vial. Chelsea´s litter-mate, Katie, is still with Monette. Greater Victoria offers a vast array of services for animal lovers, who can choose from mobile grooming and veterinary services to day care facilities, spas and kennels that offer dog walking and tooth care. Monette is modeling her new business after a similar one she ran in Quebec from 2004 to February of this year. She sold it after working with more than 3,000 families. The majority of the business was with dogs and cats, but other pets included lizards, snakes, rats, birds, a large goldfish, guinea pigs, rabbits and hedgehogs. After a career in the airline industry in the U.S., Monette retired and opened the Quebec business, eventually deciding to head west. A memorial wall with a flat screen will show pets that have passed away, she said. The building -- still in the process of being converted -- will include a waterfall and retail products such as urns and blown-glass pendants embedded with ashes. A "remembrance" package of $95 includes picking up the pet, transporting it in a casket, pet hair clipping and memorial card, a certificate of life, a paw print, and transferring the pet to its final resting place. That does not include cemetery space. Monette is currently looking for land. Cameras will be placed in the memorial area and in a nearby room in case anyone wants to watch via live feeds. Events to celebrate a pet´s life will also be held, Monette said.